Diocese of Rochester | What does a Bishop do? Home > Diocese > Bishops > What does a Bishop do? Bishop James Langstaff first became Bishop of Rochester in November 2010 legally. He was formally introduced to the Diocese as the Bishop in December. Prior to this, he was the suffragen Bishop in Norfolk for six years. Bishop James said, “When I moved to Rochester there were different levels of change. I was coming back to communities in an urban environment which is what I am more used to”. Bishop James studied Politics, Philosophy and Economics at St Catherine’s College, Oxford University with the intention of going into business management. However, he said, “Some people would say that I am in business management now. I was very involved in the Christian Union and the Church at university. I was asked by one of the chaplains whether I had ever thought about ordination training or that God might be calling me to do so. I really trusted this chaplain and knew he did not say things lightly. So, after university I spent a year as a Lay Priest as a way of testing whether this was the right thing to do and I got to the point where I decided to put myself forward for ordination training”. Bishop James stated, “Becoming a Diocesan Bishop was a surprise. I didn’t become ordained with the intention of becoming a Bishop. I suppose others see things in you that you don’t see yourself. I don’t think anyone should want to become a Bishop or Archbishop, it should be a calling”. After ordination, Bishop James first worked as a Vicar. He said, “I was very happy being the parish priest as I was part of the community, so I got to know people really well. I also saw people growing in spirituality and I felt privileged to witness that”. The role of Bishop is very different from that of a Vicar. Bishop James said, “Stepping into the role of the Bishop, I realised the true difference. The buck stops with you. As a Bishop, you have more responsibility nationally. It is a very stimulating role as I meet a lot of different people in different situations ranging from a community project supporting the homeless to national meetings to interviewing ordinands. I think it is a privilege to have that breadth of interaction”. However, there are parts of his job that the Bishop enjoys less. He said, “People sometimes get upset with their parish priests. When that happens, I am the one who receives the letter of complaint and has to deal with it”. Sometimes matters are needed to be taken further. Bishop James said, “Very rarely, I have to take formal disciplinary measures with a member of the clergy. It is a difficult thing to do as it affects not only the individuals involved, but their families and their parish”. The Bishop does not make decisions wholly by himself. He said, "The Church is led by a lot of people together as a common mind”. He is influenced by the Bishop’s Council. Bishop James said, “They are like the board of directors of the Diocese. They are made up of the senior clergy and some elected parish clergy and lay people. I consult them on varying matters such as finance. Some bigger decisions have to be taken forward to Synod”. The Bishop and three elected members from each parish in the Diocese attend Diocesan Synod. This is a much bigger committee which is consulted with regards to bigger decisions such as approving the Diocesan budget. Bishop James said, “The Bishop’s Council is the key body at this event. I think it is a useful means of gaining different views with regards to a variety of issues, such as the debate concerning women bishops”. As well as the Diocesan Synod, there is also a General Synod. Bishop James said, “The General Synod makes decisions on things of a more national scale. It is separated into three houses: the House of Bishops, the House of Laity and the House of Clergy. When voting about big issues, the votes are counted separately in each house, and the votes have to win by a two-thirds majority”. Bishop James said, “At synod we discuss legislatives and act as a kind of parliament where we can change the rules and how the Church functions nationally”. Matters that are discussed at General Synod vary at each meeting. Bishop James said, “From time-to-time Synod discusses topical issues so the Church can contribute to national issues. For example, next year is the 800th anniversary of the signing of the Magna Carta and we would discuss how the Church will be part of that”. Bishop James said, “I am very involved in the Eucharist. I am present on most Sundays in a parish either as a celebrant or and officiate. Sometimes the services are combined with other events such as a confirmation. At big Diocesan Eucharists I am usually the principal celebrant. Bishop James visits various schools across the Diocese. He said, “Going to schools is great fun. Each time I go to a primary school the experience is very different. Sometimes I will be there to give an assembly and lead the school in collective worship, or other times it can be for a special event such as to open a new building”. Bishop James also visits secondary schools but with different purposes. Bishop James said, “I enjoy sitting down with a group of pupils and giving them the opportunity to quiz me on whatever they want to talk about. I also attend more formal occasions such as prize givings or speech days. The Bishop also visits community groups and projects which can sometimes be ecumenical or solely Anglican. Bishop James said, “I will visit a project such as a food bank or a project aiming to help the homeless. I do it to encourage the people there and remind them that they are part of something bigger: the Diocesan network and family. I am simply saying to them that what they are doing is worthwhile”. As well as going outside the Church to interact with the community, the Bishop also holds events within the Cathedral grounds. Bishop James said, “We invited all of the head-teachers from the schools in the Diocese to the Cathedral as a way of saying thank you. I take the initiative to instigate planning of these events and then discuss it with my senior colleagues”. 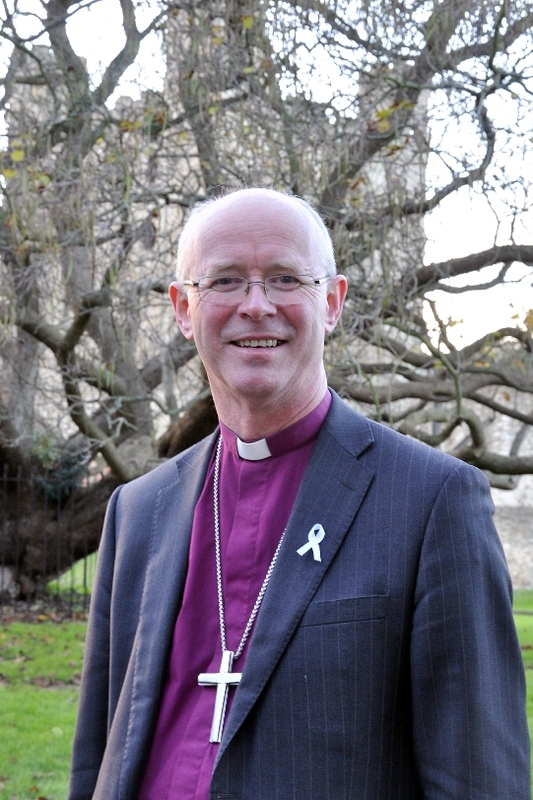 Along with 25 other Bishops, Bishop James has a seat in The House of Lords. Bishop James said, “I became a member of The House of Lords in April this year as one of the most senior Bishops in the country. When one Bishop retires, there is a vacant seat to be filled”. The role itself is different from what might be expected. He said, “It is a strange role and an accident of history from when the Bishops were part of the King’s Council. We are not there as Church of England representatives, but more as people who speak from the perspective of Faith. We show how spiritual life is an important part of modern Britain’s character”. There are various national portfolios which are shared amongst the Bishops. Bishop James also has the Portfolio for Prisons. He explained, “I am the Church’s spokesperson on criminal justice issues and so bring the Christian voice into debates of that nature. I encourage prison chaplains and, where necessary, speak up for them”. This role has also enabled Bishop James to become involved in various charities. He said, “I help to bridge the gap between the Church and various charities as well as support those within the charities. I am the patron of Prisoners Abroad which supports Britons imprisoned in other countries. This can involve being a speaker at conferences and attending other events relating to the cause”. Each Bishop can express interest in a particular portfolio should they wish to. Bishop James said, “I have had a longstanding interest in the subject and so, when the role became vacant, I put myself forward”. Due to the nature of being a Bishop, it is likely that Bishop James will stay in Rochester until he retires (unless the Queen or the Church decide otherwise). However, it may be that he retires from his role as Bishop earlier than the age of 70. Bishop James said, “I would probably do another form of ministry if I felt I no longer had the energy necessary to be in this role, but I don’t tend to worry. I think about what I am doing in the here and now”. A short video What does a Bishop do?